Welcome to AP World History, or WHAP! as I like to call it. Use the links below or the navigation pane to the left to navigate around the WHAP section of the site. Concerned about how to spread out the course? Want to see if you're on pace to be ready for the exam? Check out the pacing charts below. The "static" chart will show you where you should be if you use the traditional start date of the school year, August 15th. The "dynamic" chart allows you to plug in your own start date. Just keep in mind that the exam is on May 12th, 2017 and there's no changing that! ​This year (just like last year!) 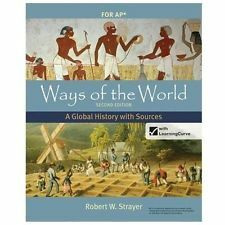 we will be using the 2nd edition of Strayer's "Ways of the World". We have digital access to the book via the Copia eBook app. When you register for the class, you should be emailed your username and password for the Copia site. You can find instructions for accessing the book in the file below.